I read an article last night that really upset me. Not so much what was in the article itself (which in itself was very arrogant and tragic), but in the comments that followed. This woman blames herself for her son’s autism. Really, she blames a myriad of doctors and nurses, but in the end, she feels guilty for a bunch of things she did THAT MOST PEOPLE DO and believes that those things caused her son’s autism. And her son’s autism is the worst thing that ever could have happened to her. Later in the comments when people try to point out that she is so focused on blame and tragedy that she can’t see the joy and blessing of a child with autism, she calls them cruel. How can she find joy in her son’s pain? How can she find joy in a situation that will make him different than everyone else and forever dependent on her? How can she find joy in such a flaw? I had to stop reading the comments at this point and really wish I hadn’t read this article at all. My heart hurts. It hurts for this woman who can’t let go of what could have been and embrace what IS. It hurts for her son who might grow up thinking that he’s flawed. It hurts for millions of people out there who might also feel this way: Am I to blame? What could I have done differently? How will my child thrive in a society like ours when s/he is so different from everyone else? I have been here. 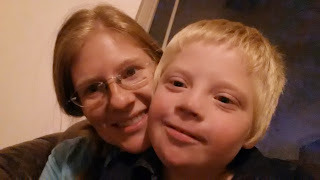 I have sat in a doctor’s office while a doctor told me that my son would have Down syndrome. I was twenty-one and married for less than a year when I found out my son would have Down syndrome. Every doctor’s appointment seemed to bring more and more bad news until I cried before every appointment. I didn’t want to go and learn that he’d have to have surgery hours after being born or he’d die. I didn’t want to know that they were concerned about his heart. I didn’t want to defend to two different specialists my decision to not learn more about abortion time-tables and options. This was not how I envisioned my life. Or the life of my son. I would lie awake at night and worry. I was so filled up with worry, sometimes I don’t know how it didn’t spill over from me and onto every around me. Maybe it did. I was in a bubble. A grief-filled bubble where no one even told me “congratulations” on my pregnancy anymore. It all felt like one, big tragedy. So, quick and super simplified lesson (since I recently learned that some people have no idea was Ds really is). Down syndrome is also known as trisomy 21. It means that the child has an extra 21st chromosome. I’d done some research online after our initial tests came back saying he might have Down syndrome and I was horrified. I had done so many things that people claimed could cause Down Syndrome—most offensive being that I had a chest x-ray done before I knew I was pregnant. Surely I had caused my son’s Down syndrome. My doctor assured me that a chromosomal disorder like this was determined when sperm met egg. There was nothing I did to cause it, nothing I could have done to prevent it. Also, in our particular case, it wasn’t genetic (determined by blood testing after my son was born). Still, it niggled—still sometimes niggles—in the back of my mind. That’s the way we’re built, I think. I’ve never met a mom who didn’t carry a heavy load of Mommy guilt on their backs at all times. 1--I could choose to continue to blame myself and the doctors and everyone around me. I could get angry at God for not sending me my ideal child and letting this happen to him and me. I could stay wrapped up in my bubble forever, shut people out, and continue to mourn my son. Because that’s what I was doing. It’s hard to understand unless you’ve been there, but you mourn the future you thought you’d have. And the future you thought your child would have. 2-- I could accept it and try to make the best of it. Once I accepted it, I could start to heal and form a new future based on not just making the most of what I had—but finding joy in it as well. I don’t know what I would have chosen without Gina Johnson. She runs Sharing Down Syndrome in Arizona, and my doctor asked my permission to share my contact information with her. Within days she called me and we set up an appointment. We spoke for hours. Then again on the phone. Then I went to her house and we spoke some more. I spent so much time with Gina and other people she introduced me to, that slowly my attitude started to change. What if I could look at this as a gift? What if this was a blessing and not the tragedy I’d believed? My son is eight years old, now. He’s had twenty-one surgeries with two more coming up. Some of those surgeries have been planned, some emergency. He spent over eight weeks in the hospital in his first year of life, and I’ve lost track of the weeks since then, but it’s enough that the pediatric nurses at our closest hospital know our names. He is in chronic stomach pain. There is nothing the doctors can do. We’ve had surgery after surgery. Loads of medicine and new medicines. He’s on adult doses of certain meds and still in pain. We’ve seen specialist after specialist trying to find something, anything to help relieve the constant pain he’s in. We’re still looking. My heart still hurts for the things he’s missed and will miss. I am a very religious person (most of you know that I’m a member of The Church of Jesus Christ of Latter-day Saints) and it’s a big deal in our church that our kids can choose to be baptized when they turn eight. Because of a volunteer position I have in my church of working with the 8-11 year old girls, I was asked to go to the baptisms for all the children in our stake the first Saturday in August. When they asked me to go, I don’t think they knew that it was the Saturday my son would have been baptized if things were different. He could be baptized, and after prayerfully considering it and talking with our bishop, we felt that Spencer wouldn’t understand what we were doing, that the crowds might cause him to act up, and that being lowered into water on his back would cause anxiety on his part. Still, even after praying about it and knowing that we needed to wait until he understood, even knowing that he would never have to be baptized and that would be okay for him, I did not want to go to that baptism. I could have said something, but I didn’t. I went. Maybe part of me wanted to go and mourn. And I did. I watched these beautiful children, all my son’s age, get baptized. They talked to their parents, they had friends, they could stand in front of a crowd of people and sit still when appropriate. They didn't run around the room knocking things over and throwing things, or bolt out the door for their parents to hopefully catch before they got outside to the street. They were preparing for a future that would lead to missions and marriage and families and children of their own. All things my son may never experience in this life. So, I understand the heartbreak of difference. I understand of the hurt of seeing your child hurt. I understand the helplessness a mother feels when there’s nothing you can do but sit by your child’s hospital bed and pray. I understand the glares and judging comments from people when your child acts out in public. I understand what it feels to have people watch you struggle and do nothing to help. But, he’s still a blessing. He’s still a joy. And I absolutely love my life. Yes, it’s hard and I’ve spent many nights crying myself to sleep because of stress and frustration, but I would not trade it for the future I thought I wanted back when I first got pregnant. I would not change who I have become because of him. I am a better person. More compassionate than I was. More able to see the light in dark things. I am strong. It is not cruel to find joy in hard things. Beautiful article, Kaylee. I didn't know about the baptism day in August - that must have been so hard! I tear up imagining how you felt! You're amazing. So glad you shared this. It hits home to so many of us. Thank you for your sweet spirit and understanding. I remember that day because I sat by you and,we talked about eternity and how joyful it will be because Sweet Spencer will have no more pain and the joy in knowing that he is so special that he doesn't need baptism on earth. just like the kids who pass away way too early. But seeing other kids and parents experience the things you never will is hard. Extremely hard. There is joy in the journey. Joy in all things. The best joy is looking around and finding the joy that others have missed. Spencer does that for all of us. He knows how to bring a smile to your face. He shows you the joy in life that you might other wise have missed. You have him the gift of life but he gives us all the gift of how we should live. That's what Spencer has taught me. It is simple. Just like you said. It is love. We love your family! I'm all teary after reading this. My husband's parents look at my daughter and see flaws. They ask about surgeries and "fixes" and I'm like - LOOK AT THIS AMAZING GIRL and how little her trials will be compared to some. Thank you for this. My step-daughter is on the spectrum and she's 11. She had her first school dance last night, and all I kept thinking was, "This is going to end badly" because I was scared she would be alone, or her anxiety would kick in, or the noise would get to her and she wouldn't enjoy herself at all. Thankfully my fears were unfounded and she went--not the entire 2 hours, but still, SHE WENT--and she danced, and she enjoyed herself with no major melt downs. I'm relieved, but it is a rarity with her. She isn't able to do and enjoy a lot of things other kids her age can. I don't think she'll ever be able to. But she's smart, and she's bright and she's artistic and bubbly and can tell you random facts about almost anything. So it IS hard, but you love them regardless and you teach them they still have so much to offer the world and everyone around them. Kaylee, you are lovely and amazing. Thank you for this. That was beautiful. And made me cry right here at work (fortunately, no one saw me crying). We love Spencer and can't imagine life without him!! I am in tears. :) You are such a great mom and a great example to me of how to raise my own daughter... with pure Christ-like love. Thank you for sharing this with us. Spencer is the greatest blessing that has come into our family. We love and adore him. We just wouldn't be the same without him. You are such a wonderful parent and everyone that knows you loves you. You have brought so much joy to all those around you. This article needs to be handed out at every bus stop and pediatrician's office and everywhere. Thank you.